New Shadowstitch cards have arrived. 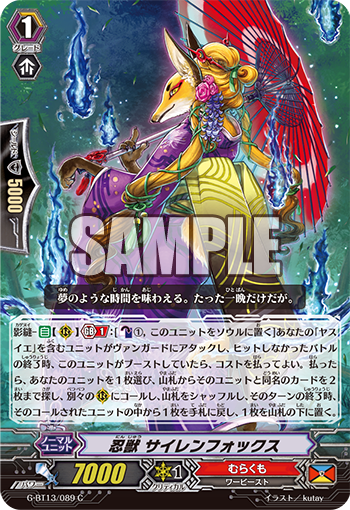 Shadowstitch – AUTO (RC) Generation Break 1: [Counter Blast 1 & Place this Unit into the Soul] At the end of a battle in which your “Yasuie” Unit attacks a Vanguard but did not hit, if this Unit Boosted, you can pay the cost. If you pay it, choose 1 of your Units, search your Deck for up to 2 Units with the same name as that Unit, Call them to separate (RC), shuffle the Deck, and when that turn ends, 1 of the Units Called is returned to the hand, while the other is placed on the bottom of the Deck. AUTO (RC): [Place this Unit into the Soul] During a battle in which this Unit Boosted a Unit with the Shadowstitch ability, and that attack Hit, you can pay the cost. If you pay it, Counter Charge 1, then choose up to 1 card with the Shadowstitch ability from your Drop Zone, place it on the bottom of your Deck. If one was placed, draw 1 card. For Today’s Card, we’re introducing the following from the 13th Booster Pack “Ultimate Stride” (on sale November 17th, 2017): The 《Murakumo》 【Shadowstitch】 support Units, “Stealth Beast, Siren Fox” and “Disciple Stealth Rogue, Minosuke”. “Stealth Beast, Siren Fox” at the end of a battle in which it Boosted it a “Yasuie” that attacked a Vanguard but failed to Hit, you can pay the Cost to choose 1 Ally Unit and Call 2 Units with the same name as that Unit from the Deck, and when the turn ends, one returns to the Deck and the other to the hand. By Calling 2, you can Call 2 to the Front Row to inceease the number of your attacks by 2, and when the turn ends, you can return 1 to the hand with this SKill, meaning you can prepare for an attack during your opponent’s next turn, making this an all around card. As well, “Disciple Stealth Rogue, Minosuke” is a 【Shadowstitch】 exclusive First Vanguard. When a Unit with 【Shadowstitch】 this card Boosts Attacks and Hits, you can place this card into the Soul to Counter Charge 1! And you can also return 1 Unit with 【Shadowstitch】 from your Drop Zone back to the Deck, and then draw 1 card. With this you can return cards you need that have fallen into the Drop Zone, while replenishing your hand. If your opponent is playing with a Clan that specializes in Retires, this is an effect you can use early on to counter their Retire effects. These two cards are sure to strengthen a “Yasuie” Deck! We’ll be introducing more cards from the 13th Booster Pack “Ultimate Stride” in the future! Please look forward to it!